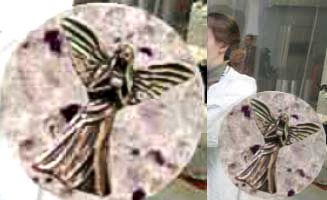 UFO SIGHTINGS DAILY: Residents Are Terrified Of Winged Creature In Town, Argentina, Aug 2015, UFO Sighting News. 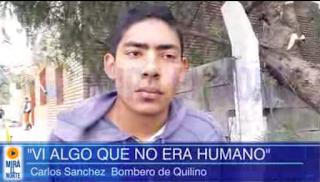 Residents Are Terrified Of Winged Creature In Town, Argentina, Aug 2015, UFO Sighting News. I have heard about a species of aliens that do have wings. There has been evidence from thousands of years about angels, as we call them, but they are an alien species. Such evidence has even been found on the moon when Apollo 11 mission in 1969 found the ten inch sculpture of an angel...so reported a female NASA scientist many years ago. Photo below. They are real. Argentina: Strange Shadow Terrorizes Residents of Quilino 08.11.15 | 16:26 | Residents of this community in the province of Cordoba have been reporting manifestations of a shadowy human figure for the past 15 days. It was seen by volunteer firefighters last night in the downtown area. Residents of the community of Quilino, in northeastern Cordoba province, are terrified by the strange manifestation of a shadow. There is even a call for evidence before the courts. The Head of the Ischilín Department, Chief Constable Jose Ceccarelli, told Cadena 3 that the first ones to report the situation were residents of Barrio Tigre, and that volunteer firefighters had become aware of a strange presence. "It is publicly known that those claiming to have seen certain spots, shadows or human-like figures were never in close contact with such presence," Ceccarelli explained. He further added that a call for evidence was opened as soon as the situation began, so that if a perd +son is eventually arrested, the prosecutor's notice may be alerted. "But no crime or violation [of the law] has been recorded as a result of this supposed presence," said the constable. "According to them (the neighbors), shadows similar to those of a human being were reported, which then disappeared," he explained. Ceccarelli stated that complaints were received 15 days ago in the Tigre area, "where locals had phoned the police to say they had captured it, but upon the arrival of police personnel, it was nowhere to be found. Last night we had an alleged manifestation of these characteristics in the downtown area, near to the where the fire fighters are located," he stated.